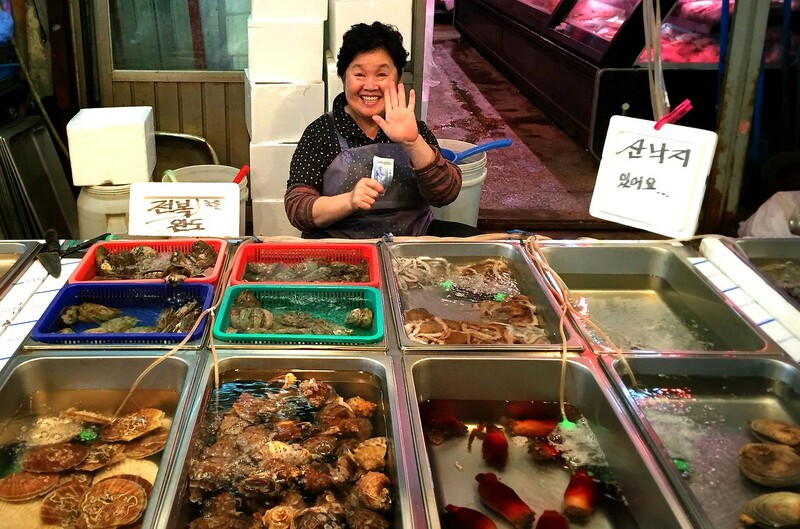 As usual for us, many of our experiences during our visit to Seoul involve food. 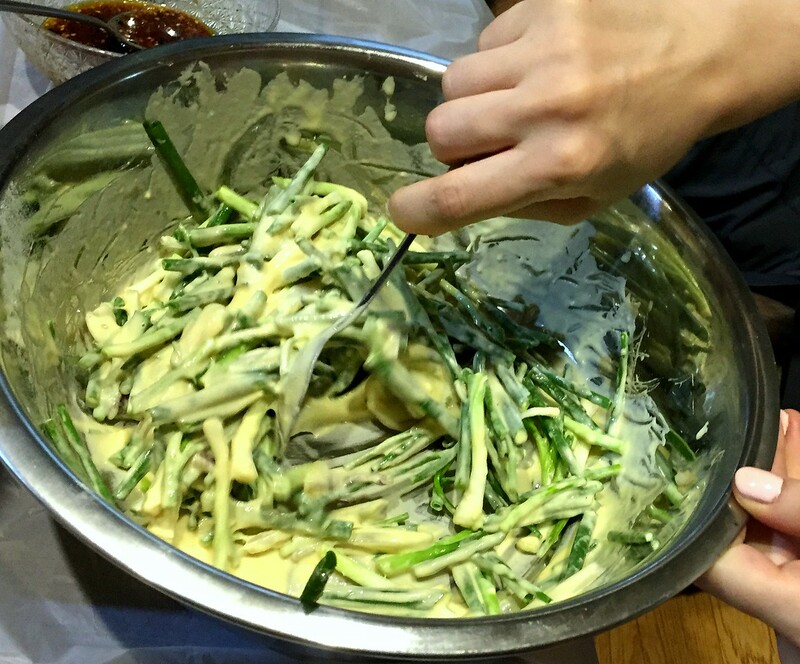 I like Korean food, but a lot of it is still unfamiliar to me, so I figured a Korean home cooking class would be a fun way to learn more about Korean cuisine and ingredients. OME Cooking Lab in Seoul offers a Korean home cooking class, so I signed up, hoping to learn enough to make a couple of the most popular dishes myself. 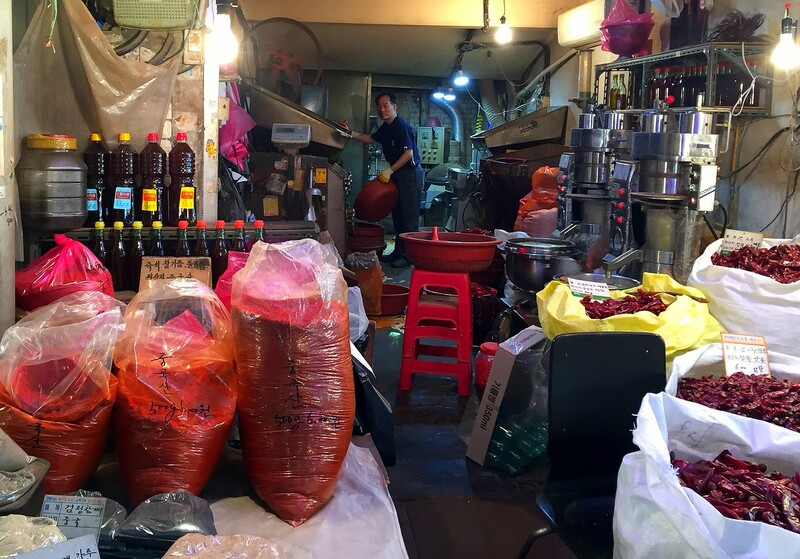 Our class of six first toured the Gyeongdong market in the Dongdaemun District. Gyeongdong (or Kyungdong) is the largest wholesale food market in Seoul, and you can find every meat or produce imaginable, as well as herbal medicines and ginseng. Shredded peppers were one of the ingredients we would be using in our tofu stew. The quality of the produce and other foods looked very high, and we also saw small manufacturers producing staples such as sesame oil and Korea’s famous red pepper flakes (gochugaru). After the market we went to cook and then eat together in a traditional style Korean house. Our menu of traditional Korean foods consisted of mushroom soft-tofu stew, beef bulgogi, jeon (Korean pancake) and acorn jelly salad. The first task was making the delicious sauce for the bulgogi, which includes soy sauce, garlic, green onion, sesame oil, sugar, and pepper. 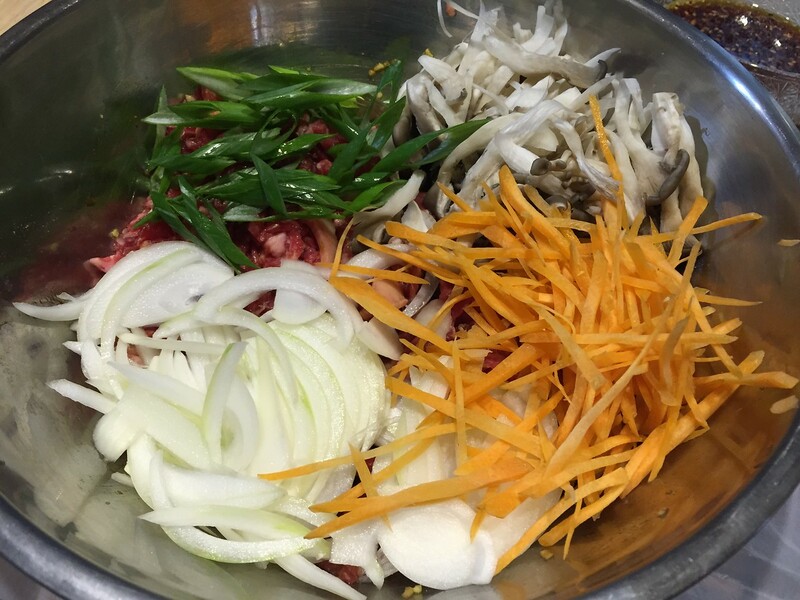 Thin sliced beef is first marinated in the sauce, then we pan-fried it with onions scallions, mushrooms and carrots. Our chef/teacher Minseon explained that a well-planned Korean meal should include five colours (or close variations): green, white, red, black and yellow—representing the five basic elements wood, metal, fire, water and earth. As you can see we did so with the ingredients for the beef bulgogi. 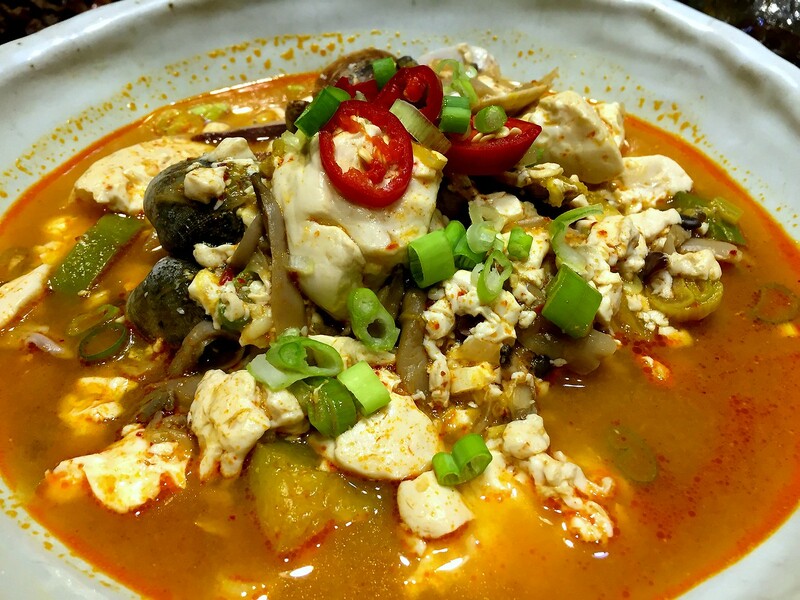 The soup is a flavourful and spicy combination of green onion, garlic, soft tofu, mushrooms, clams, and Korean red pepper. I was given the job of shredding mushrooms for the soup. I usually chop mushrooms with a knife but shredding them worked really well. Jeon or Korean pancakes are a very popular food item. Making jeon is quite simple – mix the batter, then add the vegetable or seafood, and fry until crispy on each side. We made green onion jeon or pajeon, and also cute little zucchini jeon, but you can also make kimchi jeon, or seafood jeon. Jeon is often enjoyed together with Makgeolli, a milky, refreshing, rice wine. Tip: Using ice-cold water in the batter helps make the pancake more crispy. Lastly was the acorn jelly salad. The acorn jelly was already made, so we only had to make the salad dressing, then arrange the jelly on the plate first, topped with the salad. Since having it at the class I’ve noticed it is a fairly popular banchan item (Korean side dish), at least this time of year. Time to eat our Korean feast, (left to right): soft-tofu stew with clams, beef bulgogi, acorn jelly salad, and Korean pancake (jeon). The meal was delicious, and I’ll try making these dishes myself at home. 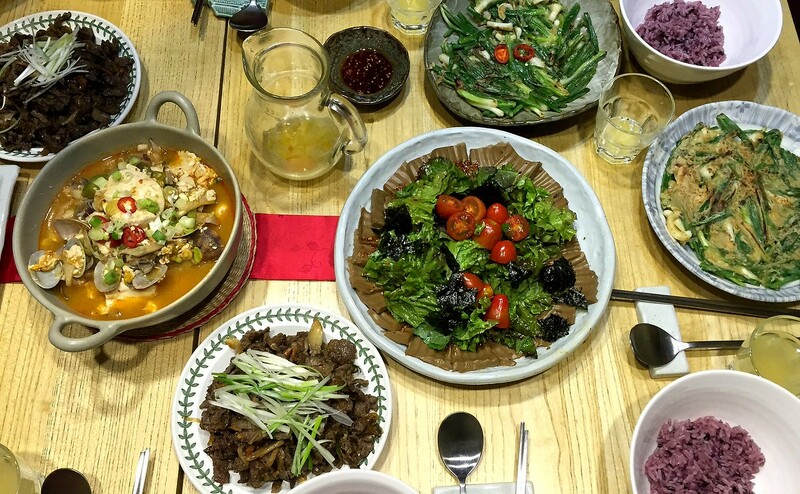 If you are interested in a fun, Korean cooking lesson, I would recommend OME Cooking Lab. Our chef/teacher Minseon was friendly and knowledgable, with lots of tips and information about the ingredients. She has even traveled to over 20 countries to experience and understand different cultures and foods. You can find more information about the OME Cooking Lab at 5-tastes.com. Have you tried eating or cooking Korean food? Hi Shelley! What a great looking meal you made. The only think I probably wouldn’t eat is the acorn jelly. Over the years, I have tried it many times, but the texture always gets me. Tofu stew is something that I love. I ate a lot of jeon this weekend. My landlords gave me a huge feast of various homemade jeon as a Chuseok gift. I think you were in Busan for Chuseok. I hope you had a great time. Love onion pancakes! A Korean friend used to bring them to work sometimes…mmmmm. The tofu stew looks good too, and I don’t even like tofu. How fun! I love Korean food and have tried cooking bulgogi…to some success. But thanks for letting me know about the colors needed to complete dishes! And the Korean pancakes? We have something like that in the Philippines! We call it okoy! I didn’t know they have onion pancakes in the Philippines too. I’ve also had something similar in Chinese food. My goodness, it looks as though everyone who’s anyone has been in Korea recently! This looks to be such a wonderful experience. 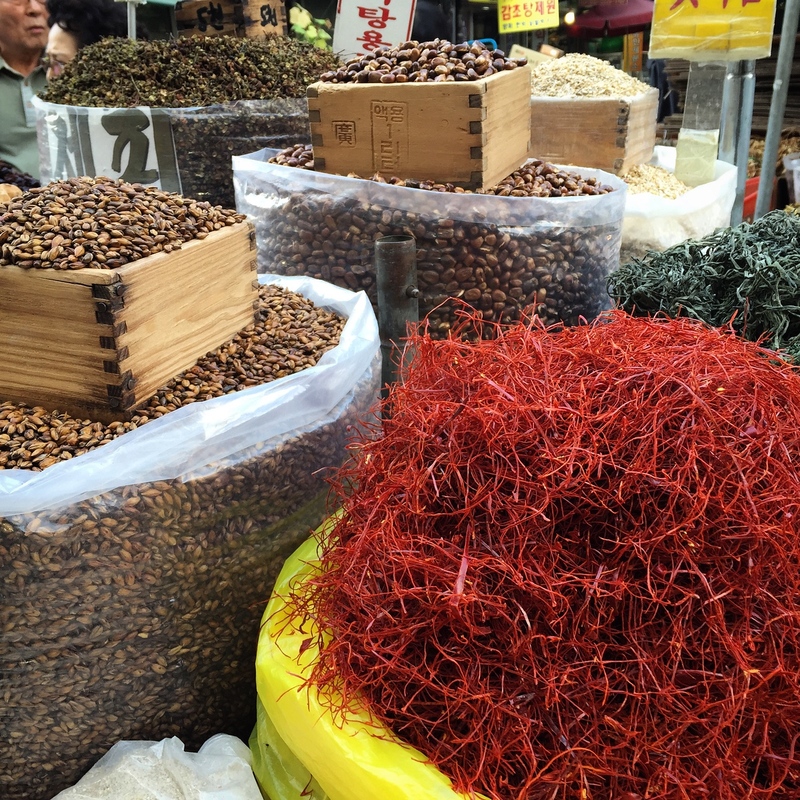 We love visiting markets and learning how to cook like locals. 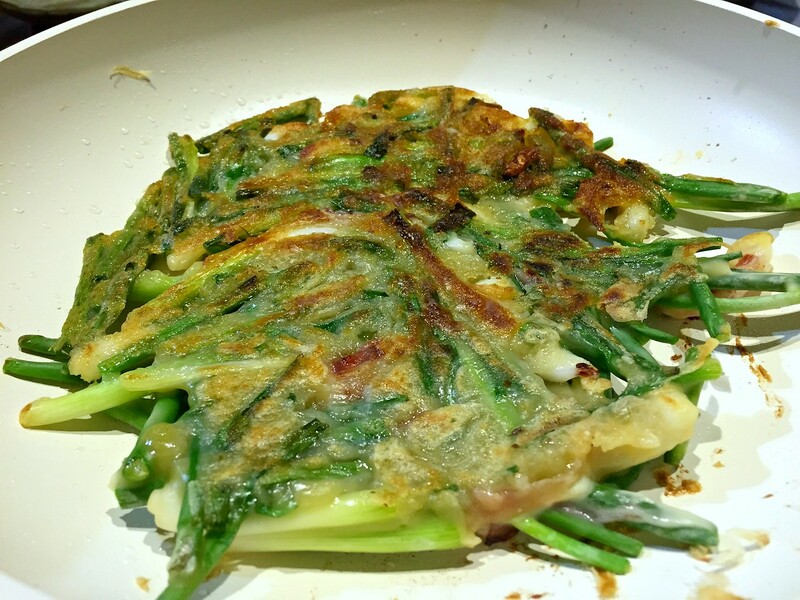 The green onion pancake would be the first thing I’d want to learn how to make in a Korean cooking class. Right eh? Korea is a fun country to visit. The green onion pancakes are probably the first thing I’ll try once we get home too. I wish I could have done one of these classes while I was there. It was outside my budget though, unfortunately. I’d like to try cooking some bulgogi one of these days when I have the time. I really liked bulgogi too, and would like to give it a try at home. I am not familiar with many Korean dishes so a cooking class would appeal to me. The dishes all look delicious, especially the jeong! Was it easy to make? It was also interesting to learn that the five colours should be represented in a Korean meal. The jeon was pretty easy to make. I liked that the ones we made had lots of vegetables (onion in this case) and light on the batter. What an interesting experience! I love Korean food, especially those onion pancakes but I often find Korean restaurants confusing. A cooking class would be a great way to learn more. I agree that Korean restaurants can be confusing – especially the bbq places where you cook your own food. Some places they watch us and tell us we are turning our meat too soon etc. This cooking class was a great introduction to the basic flavours and ingredients.